MicroVu Training Seminars: We now offer hands on seminars at our Bartlett location for our customers who have both Manual and Automated Systems. 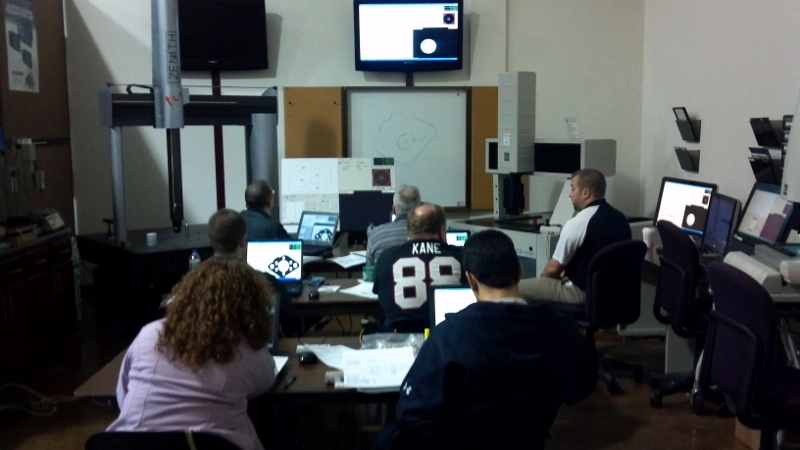 ATI can provide training on a wide variety of Metrology equipment - optical comparators, hardness testers, metrology software and ISO 17025 calibration techniques just scratch the surface of our capabilities. ATI's focus is to help you and your staff utilize your equipment to it's fullest capacity, maximizing your accuracy while minimizing your analysis time, all crucial elements to your company's success. We can perform this training at your facility or at ours. Our training is from basic to more advanced techniques including refresher courses and is structured to allow you time to work with your equipment and/or software before the next training session occurs. This gives your staff an advantage in the next training session providing them with the opportunity to ask specific questions relative to their needs. We can also customize the training focusing on the specific needs of your organization. For each member attending a training session, a Training Certificate is provided. If you are interested in our Training Services, please click on the link below for the Training Request Form or contact us directly. Assurance Technologies can also provide technical support for problems with your software or equipment. Our staff of experienced metrologists are available to answer your questions and help you resolve any problems you may have. This support can be handled over the phone, onsite or you can click on the Support Request Form link below to request support. A member of our team will be in contact with you within 24 hours of your request. © Assurance Technologies, Inc. All Rights Reserved.